Terry York is himself a master “spooner” and plays other jug band instruments. He has taught workshops at numerous festivals and camps. 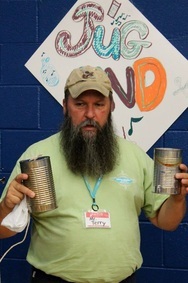 In his workshop, "The Bucket Bass, Spoons & Other Fun Instruments", Terry will perform demonstrations and you will learn to play some homemade and “found” instruments such as spoons, jugs, washboards, and kazoos.